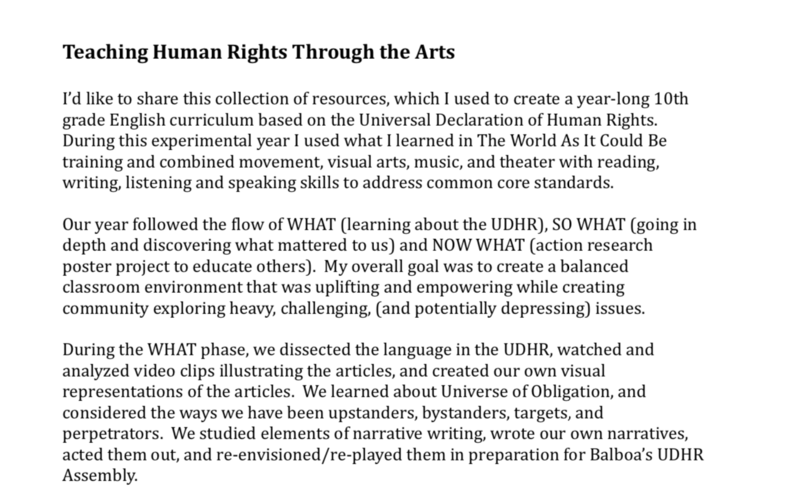 Jill Smith explains how she used the UDHR in her English class at Balboa High School. Add 29 students from five countries. Fold in equal parts reading, writing, listening, and speaking, and courage. While continuing to stir, add 1 cup each singing, movement, music, and art. Season with 1 tablespoon each gratitude, reflection, empathy, and action. Reduce heat and simmer gently from September to May until flavors intensify and deepen. Serve warm to a hungry world. 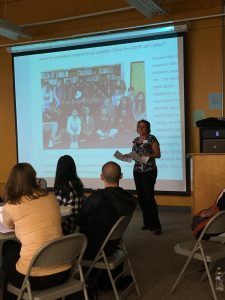 At our recent Institute at Balboa High School in San Francisco, Balboa teacher Jill Smith offered a presentation on how she developed her full-year 10th grade English class with the UDHR as the guiding content. We wanted to share this success story (and great resource) with you. A Personal Reflection: ?“It’s time we stop, hey, what’s that sound. Everybody look what’s going down!”? The World as it Could Be is a program of The Alameda County Deputy Sheriff’s Activities League (DSAL). Copyright © 2016–2019 The World as it Could Be. Except where otherwise noted, content on this site is licensed under a Creative Commons Attribution 4.0 International License.